City life impacts your health. We’re not talking about “city life” in any abstract sense. Take the term literally. We’re talking about the actual biology of the city, urban ecology. More specifically, we’re talking about metropolitan plant life. There is a concrete relationship between the relative concentration of vegetated surfaces, such as grass, versus that of non-vegetated surfaces, such as actual concrete. That’s the latest finding from a group of Miami researchers who study the impact of the built environment as it relates to community health. The research team, led by faculty at the University of Miami’s Schools of Medicine and Architecture, and includes officials from the Miami-Dade County Parks Department, measured the distribution and pattern of vegetated surfaces throughout Miami-Dade. They then sought to compare neighborhoods in terms of both block-level vegetation and prevalence of illness. Miami Geographic‘s article “Public Health Study: Proximity to Sprawl Affects Walkability” summarized previous research findings made by some of these Miami-based built environment and health researchers. The current study, also published in the American Journal of Preventive Medicine, is titled “Neighborhood Greenness and Chronic Health Conditions in Medicare Beneficiaries”. Funding for the project came from the Department of Housing and Urban Development’s Sustainable Communities Research Grant Program. While both papers document research investigating how the built environment impacts quality of life and associated health outcomes, their objectives, data, and methods are quite disparate. Rather than examine proximity to sprawl versus proximity to the core in relation to walkability, as was done in the previous study, the current research sought to assess the relative ‘greenness’ of vegetation in relation to chronic disease. That construct, greenness, was operationalized as a quantitative variable through a commonly used vegetation index, the normalized difference vegetation index (NDVI). NDVI produces values ranging from -1.00 to 1.00. Areas of barren rock, sand, or snow usually show very low NDVI values (for example, 0.1 or less). Sparse vegetation such as shrubs and grasslands or crops may result in moderate NDVI values (approximately 0.2 to 0.5). High NDVI values (approximately 0.6 to 0.9) correspond to dense vegetation such as that found in temperate and tropical forests or crops at their peak growth stage. NDVI was calculated from multi-spectral satellite imagery data. Values were aggregated at the census block level and summarized as mean NDVI per block. The broad, county-level patterns we see shouldn’t be too surprising. These patterns correspond roughly to the spatial footprint of the Miami metropolitan region, especially within the urban development boundary. County land use also dictates some aspects of the general pattern we see in greenness, but even within the same use category, the comparative presence and robustness of of vegetation is never identical. Neighborhood greenness in the single-family residential areas of the City of South Miami, for instance, is much different in quantity and quality than that of the single-family areas of the City of Hialeah. Additional analyses into the interrelationships of urban land use / land cover and vegetation are warranted. 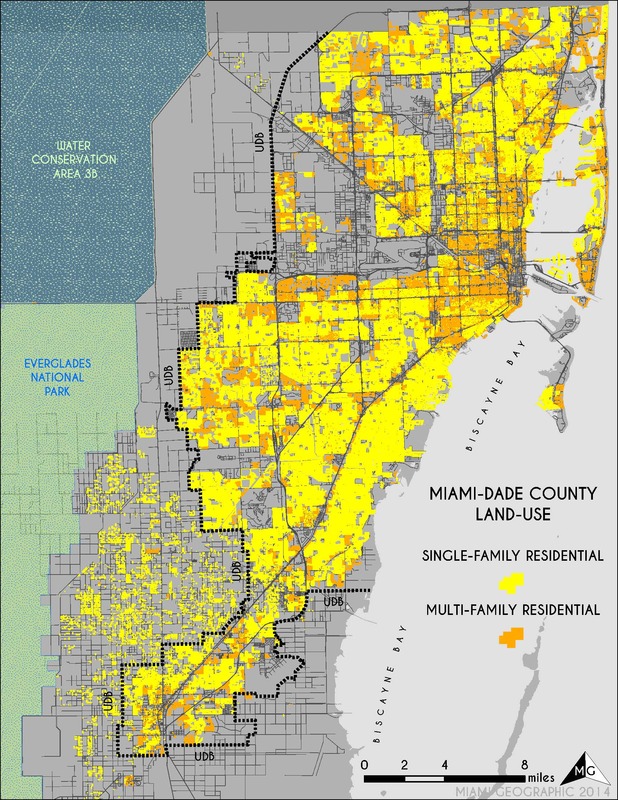 Residential Land Use in Miami-Dade. Source: Matthew Toro. 2014. Commercial Land Use in Miami-Dade. Source: Matthew Toro. 2014. Industrial Land Use in Miami-Dade. Source: Matthew Toro. 2014. 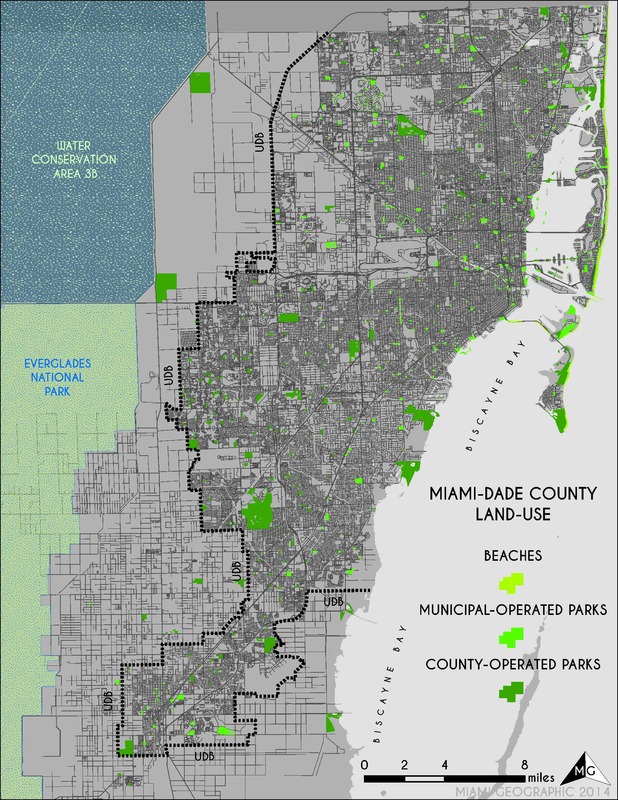 Park Land Use in Miami-Dade. Source: Matthew Toro. 2014. 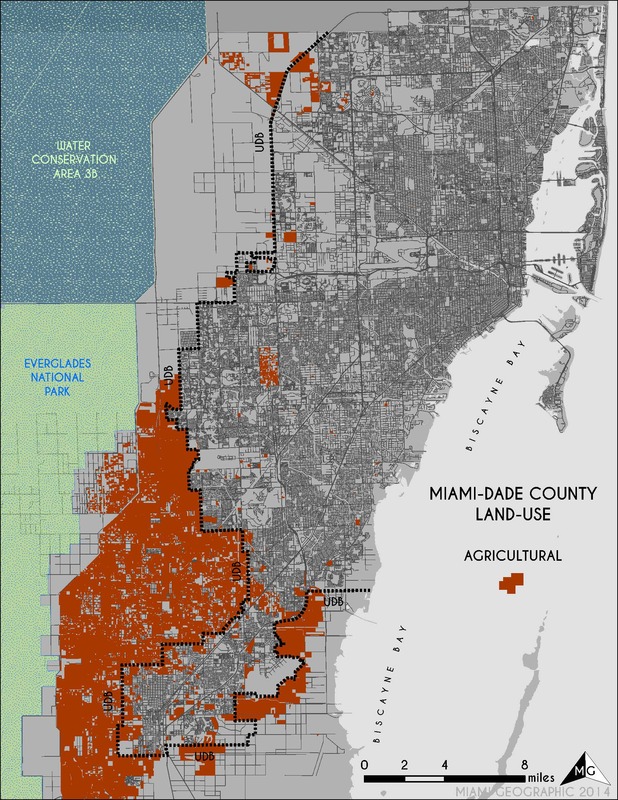 Agricultural Land Use in Miami-Dade. Source: Matthew Toro. 2014. So what do greenness levels have to do with chronic illness in urban environments? The team collected health data on a large sample of Medicare beneficiaries. Medicare is the US government’s insurance program for Americans 65 years and older who have paid into the system. It’s healthcare for older Americans. Health records for approximately 250,000 recipients of Medicare benefits were ultimately analyzed (after filtering the dataset along various eligibility criteria). Within those quarter-million Medicare beneficiary records were data on a range of 27 chronic conditions derived from algorithms developed by the Centers for Medicare and Medicaid Services’ (CMS’) Chronic Conditions Warehouse. cancer in the uterus lining (endometrial cancer). So what’s the lesson here? How is any of this useful in terms of urban design, planning, and public health policy? There’s already a strong body of evidence supporting the fact that higher vegetation levels improve public health. Many scholarly articles in the literature focus on the psychological impacts of keeping and bringing more nature in the city. Apart from the mental health benefits of improved access to greenspace, though, this study emphasizes physical health benefits too, especially with regard to reducing some of the most fatal chronic health risks prevalent in American society. Think about it: Where would you prefer to take an after-lunch stroll, or meet your loved one for a picnic, or get in your daily work-out, or hang-out with your friends, or have your beloved abuelita live? In a neighborhood characterized by streets lined with thick green shade trees and shrubbery, or in a neighborhood filled with comparatively barren streets dominated by the black and greys of ashpalt and concrete? Enhanced neighborhood greenness equates to more active, more socially-engaging environments. These sorts of places produce healthier lifestyles than their less green counterparts. Of course, lush urban vegetation also brings critical ecological benefits, property value benefits, traffic-calming and transportation safety benefits, among many others, but looking at the benefits to community health alone is enough to justify prioritizing the greening of our cities. Particularly interesting is the team’s finding that the health benefits seen by increasing access to greenspaces in low- and medium-income neighborhoods is relatively greater than those seen in wealthier communities. Not coincidentally, these less affluent neighborhoods are also more vulnerable when it comes to access to medical care and overall physical well-being. Our community leaders can therefore potentially make huge impacts on our collective liveability, our collective public health, by ensuring that all of Miami’s neighborhoods, rich and poor, get equitable access to nature in the city. The process of calculating NDVI isn’t too hard to understand. First, you need multi-spectral imagery of your study area. Such images typically come from satellite sensor systems orbiting and taking photographs of the Earth as you read this very sentence. Satellite-derived multi-spectral images are not merely images, though. They’re actually data on how different wavelengths of energy interact with Earth’s different types of surface materials. Each pixel of the image has a numeric value corresponding to the energy reflecting off the planet. Multi-spectral imagery contains values of energy in different parts of the electromagnetic spectrum (EMS), the spectrum on which we can classify different types of energy, such as radio waves, microwaves, infrared waves, light waves, ultraviolet waves, x-rays, gamma waves. We humans see light in the visible parts of the spectrum — think of the colors of the rainbow. Green, photosynthesizing surfaces of vegetation such as the crowns of street trees, grass lawns, and landscaped shrubs reflect light energy differently than non-photosynthesizing surfaces such as asphalt roads, concrete buildings and sidewalks, metal bridges, tile roofs, or bodies of water. Two specific spectral bands of satellite imagery data are used in a simple ratio to derive the normalized difference vegetation index: the band of visible red light (RED), and the invisible (at least invisible to the human eye) band of near infrared light (NIR). where the difference in reflectance values between the near infrared and red bands is divided by the sum of reflectance values between the near infrared and red bands. Ready for more acronym soup? Advanced Spaceborne Thermal Emission Reflection Radiometer (ASTER) satellite imagery were used for the analysis. The ASTER mission is a joint US (National Aeronautics and Space Administration: NASA) and Japan (Ministry of Economy, Trade, and Industry: METI) effort yielding free, publicly-available 15-meter spatial resolution satellite imagery. Nice application highlighting the correlations between urban greenness and health, relationships which have a ton of confounders, as Matt notes. The authors seem to have missed some of the actual seminal literature on this, but perhaps it can help frame follow-up work. A good place to start is: Weeks et al. 2012. Connecting the dots between health, poverty and place in Accra, Ghana. Ann Amer Assoc Geog 102(5): 932-941. Thanks for checking it out, Justin! Yes; I would have definitely liked to have seen more of the geographic literature on the subject cited. I just downloaded that article you mentioned in the Annals — thanks for the lead! There is indeed so much interdisciplinary work done on vegetation and health, that can be linked to so much other related work. I’m looking forward to reading more about your work work in Accra and elsewhere. Thanks! Matthew, Nice work — congratulations on a seminal study! Islara B. Souto, MPH President/CEO Ydeas, Inc. Always so kind! Thanks, Islara! The team at UM and the Miami-Dade County Parks Dept. are awesome! Are the health effects adjusted for income? NDVI also increases property values and income levels, no? Re. income adjustment: Yes indeed, and some interesting findings related to income variability too!